It's time for another Free Motion Friday! I was doodling with triangles one day when I came up with this design. It's a large triangle with a small triangle bump inside the bottom side of the triangle. Then it's echoed around once to help with definition. Directions found Double Triangles can be found here. I started by making the basic shape: a triangle with a wedge in the bottom. Then echoing around it once. I then start a new triangle or travel along my previous stitching to get to where I want to start next. I did not worry about size/width when making my triangles. I just wanted them all to be triangles. 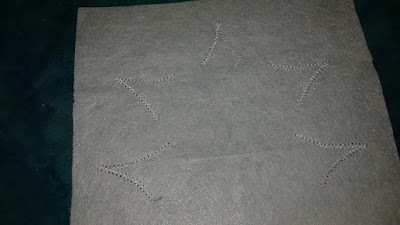 Here you can see me traveling along my stitching to get to where I want to start my next triangle. If you look behind the needle you can see that one of my triangles goes right to the edge and would technically continue under the border. That's what you have to do when you run out of space! And the final result. It's hind of haphazard, but I like that about this design. 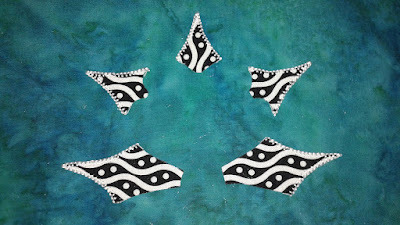 Don't forget to share pictures of your practice on my Machine Applique Adventures Facebook Group! I love to see what you're up to. I hope you get to quilt today! Flower #6 was actually the first flower I cut pieces for in this project. I love the way these white waves and dots flow over the pieces. I cut them from a 2 1/2 inch strip and had to be careful! You can't see much, but here's the back. I'm glad I chose to outline these pieces in white instead of black. I think black would've taken away from the white waves. Here's layer number two! I fussy cut the petals at the bottom and the light purple clamshell in the middle. I love to fussy cut geometric prints. It's such a blast. If you look carefully at the dark purple piece on the top part of this flower you can see that I switched the size of the blanket stitching on the inside and the outside of the piece. I used a larger size on the outside to emphasize the shape and a smaller size on the inside because I didn't want to take away from the fussy cut clamshell piece underneath. Look at that dot! I was debating what to put in the center of this flower when I realized that this motif was the exact right size to go in the center. I was glad to have some extra black fabric around the edge though so that when I did my blanket stitching it didn't cut into the pattern at all. And the back! All done! Upcoming Blog Hop will be Inspiring! If you've been following my blog, you know that I had a book come out from the American Quilter's Society in late August. 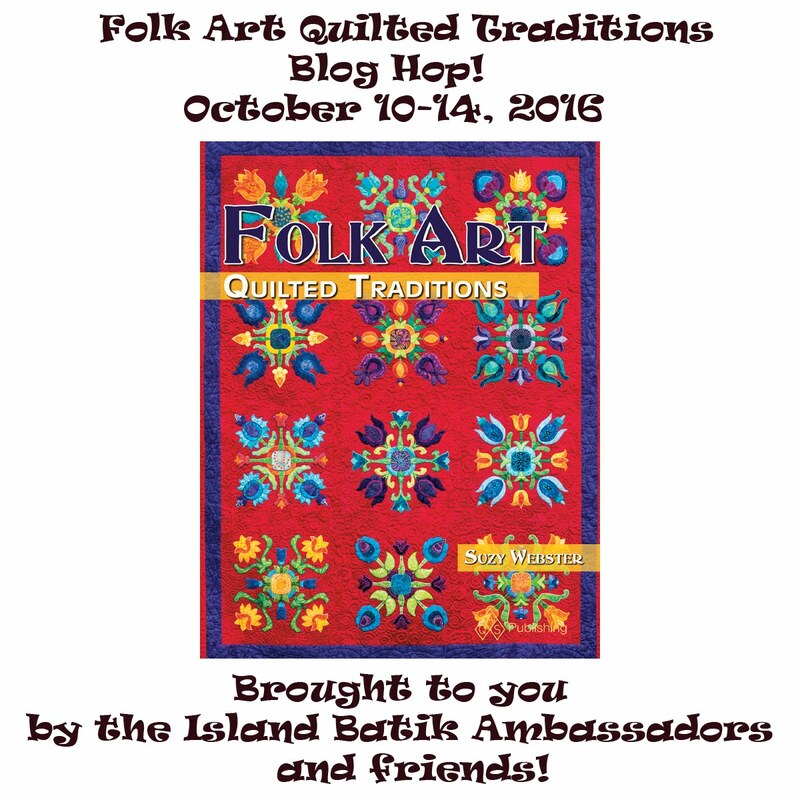 Some of my fellow Island Batik Ambassadors and friends are all working on projects from my book to share with you in a blog hop coming October 10-14! I am super excited to see what they come up with! I've seen a few of their projects via email and they promise to be fantastic! I also randomly found this design the other day when I was searching for a coloring page for my kids. It would make a fabulous quilt! 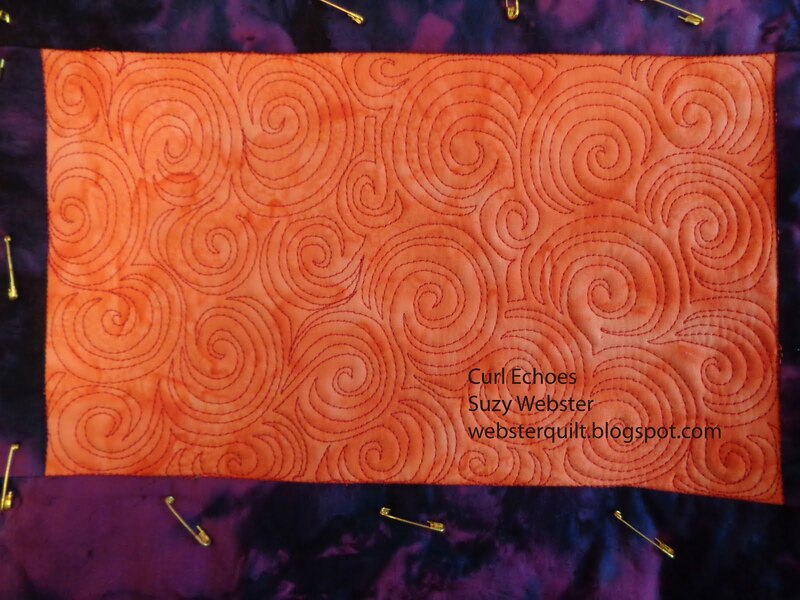 I am so loving seeing all the entries in the Blogger's Quilt Festival! Here is my miniature quilt for the Festival. Here is the process I used to make this quilt. It was a challenge for the Island Batik Ambassadors. It was really fun to make using their Fire Island line. Here are some of the gorgeous black prints from this line. Then I arranged them on a grid I'd drawn on my background fabric. Here is the finished design. 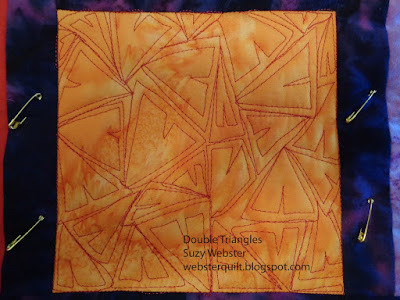 Testing quilting ideas on tracing paper. Using mirrors to reflect the quilting possibilities. The quilt after binding. I call it All Fired Up! I really like this little quilt. It's about 14 inches across. Here's a detail shot of the quilting. 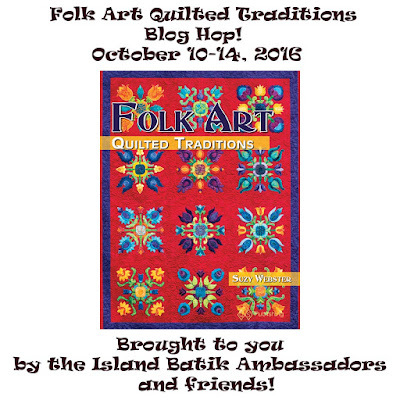 I hope you get to quilt today and be sure to check out all the quilts in the Blogger's Quilt Festival! There are many variations of curls out there and echoed curls too. This is a take on them I have been working on. If it's out there somewhere else, please let me know so I can give credit. Directions for making this design are here. Stitch in the the ditch around your block. Then start off with a small curl between 1/2 and 1 inch in diameter. Make a curl around the original curl and echo back making the distance between the lines about 1/8 of an inch. Add a third curl echoing the first two. Make an S shape off the curl ending a new curl to start your new echo. Echo this second curl two times. Make an S curve ending in a curl to start your third curl. and make two echoes around it continuing in this pattern. Here's a curl in the corner. You can see that I echoed around the curl, but had to stop in points because I hit the edge of the block. Here is another example of when I hit the edge of the block. You can see that I have an open area in the center of the picture. It's almost completely contained. These kind of areas are harder to quilt than any other kind because they have so many boundaries. I try to avoid doing this, but it happens sometimes. Another curl in the corner. Oops....a little space I made. Here's how I filled it: Make a curl and then echoed around the extra space once. Then I went into a new curl again. Saving the center for last...how do I end if I'm in the middle? Pick a place to end and just do it. NO one will find it in the final design. So....can you see where I ended in the final design? Not easy is it?! I'd love to see how your Brick Wall quilts are going! 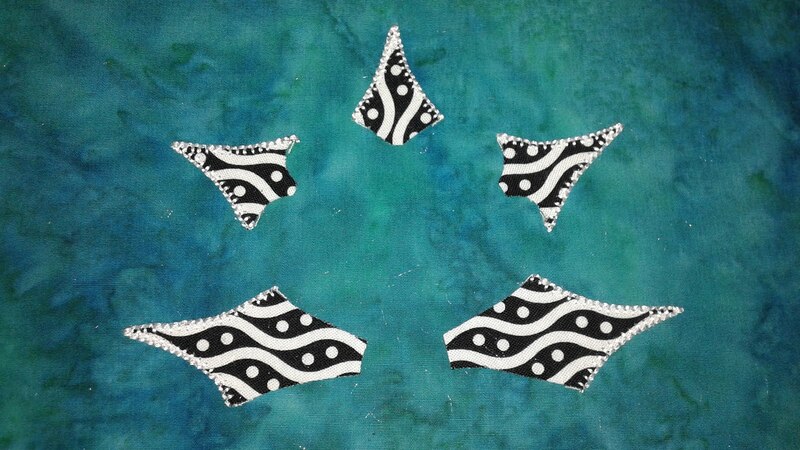 Please share your pictures on my Machine Applique Adventures Facebook Group! I love this little runner! I designed it based on a ironwork railing I saw in Prague, Czech Republic. It's a really different looking flower and that's what made it so fun. I also love the texture the quilting gave to the runner. I also had a lot of fun quilting it with designs from Christina Cameli's latest book. And the final product! It was so much fun to make and I'm excited to share it again her on the Blogger's Quilt Festival! Be sure to join my Machine Applique Adventures Facebook Group! 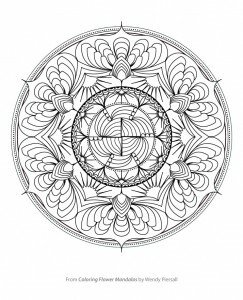 I post links to my blog and other inspirational material and it's fun to see what you're making! Sign up for the 2019 Minnesota Quilters Mystery Quilt! My Happy Place Row Along! Island Batik Ambassador's Playful Pillows! 108″ Quilt Backs From Henry Glass Fabrics! What is Society Silk Embroidery? Oh Christmas Tree, Uh-Oh Christmas Tree! Sew Let’s QAL Block 4! April Challenge - Ready, Set, Go!